One of the convicted murderers who escaped from a maximum-security prison in upstate New York three weeks ago, leading police on a manhunt through miles of difficult terrain, was shot and killed by law enforcement officers Friday, two senior state officials tell NBC News, and another law enforcement official tells NBC 4 New York gunfire was later heard as authorities tried to close in on the second fugitive. Richard Matt was shot after he, armed with a shotgun, was confronted by Customs and Border Patrol officers who were sweeping a wooded area in Malone, the Franklin County town to which authorities had narrowed their search following the discovery of new DNA evidence in a cabin, a law enforcement source familiar with the investigation tells NBC 4 New York. The officers ordered Matt to put up his hands, and he challenged them; that's when he was fatally shot by the officers, State Police Superintendent Joseph D'Amico confirmed in a news conference held alongside Gov. Cuomo Friday evening. A 20-gauge shotgun belonging to Matt was recovered from the scene. No shots were fired by Matt, and no officers were injured, D'Amico said. "You never want to see anyone lose their life," Cuomo said, but continued: "These are dangerous, dangerous men and that is why you see law enforcement from across this country before you today cooperating with one mission: to bring these gentlemen to justice." Law enforcement got a 911 call just before 2 p.m. from a man who reported hearing a loud sound while towing a mobile camper on Route 30, according to D'Amico. He at first thought it was a flat tire and got out of the camper to inspect the vehicle; he didn't find a flat and proceeded to a campground in a nearby town. That's where he found a bullet hole in the camper and called 911, said D'Amico. State police responded and determined the camper had been shot about 8 miles back, and multiple agencies were deployed to that area. Officers got into a cabin there and smelled gunpowder and realized a weapon had been fired. It also appeared someone had recently been there and fled out the back door. As law enforcement conducted a ground search in the woods near Route 30, the tactical team from Customs and Border Protection heard movement and coughs and found Matt. They engaged him, and when he refused to comply, shot him, D'Amico said. The manhunt is ongoing for the other escaped murderer, David Sweat, though law enforcement sources say two sets of footprints were located in the woods so they believe the two killers were traveling together. "There's no indication that Sweat wasn't with Matt," D'Amico said. Law enforcement officers converged on a limited wooded area late Friday afternoon where they believe Sweat may be hiding, an official said, and a round of gunshots was heard as officers tried to close in on him. D'Amico declined to detail the ongoing search for Sweat, saying only: "We are going to continue to use the same tactics over the past few weeks, which is to search 24 hours a day until we find him." He noted: "Our preference would always be to capture them alive." He reminded the public to remain vigilant and to call 911 immediately and not approach Sweat in case of a sighting. Thom Kelly, 36, says he was at his mother-in-law's house near Route 30 around the time of the shooting. 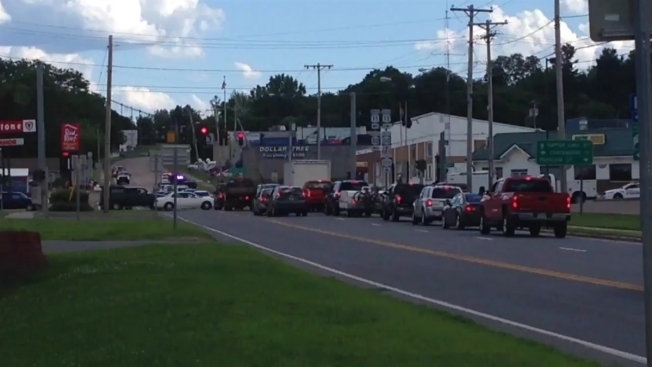 "We heard a lot of sirens by Route 30 so we stepped out to see what happened," Kelly said. "One local officer stopped by and said, 'We got one.'" At a news briefing earlier Friday, Guess said the search efforts had shifted slightly north after police found items dropped by Matt and Sweat in a cabin and field north of their last suspected location. The findings, combined with other evidence, gave investigators "a high degree of confidence" that the men may have been making a run for the border, Guess said. Guess wouldn't reveal what evidence was connected to the men, but said that officials presumed the escapees were traveling under the cover of darkness. Multiple sources with knowledge of the investigation told NBC News that DNA belonging to at least one of the escaped prisoners was found in the cabin in Malone. According to those sources, the cabin owner noticed the place had been broken into at some point Wednesday or Thursday. The timeline and location of the positive DNA test confirmed that at least one of the prisoners was able to travel about 13 miles northwest since evidence indicated the duo had been near Owls Head Saturday, the sources told NBC News. On Friday, as the search extended into its 21st day, a small contingent of New York state troopers were stationed along power lines in Malone, and motorists had to pass through a checkpoint. Other heavily armed troopers combed sheds and went door-to-door in the efforts to find the men. Sweat and Matt broke out of the prison in Dannemora on June 6. Authorities say they cut through the steel wall at the back of their cells, crawled down a catwalk, broke through a brick wall, cut their way into and out of a steam pipe and then emerged from a manhole outside the prison. Sweat, 35, was serving a life sentence without parole in the killing of a sheriff's deputy. Matt, who turned 49 on Thursday, was doing 25 years to life in the kidnapping, torture and hacksaw dismemberment of his former boss. Meanwhile, New York state prison officials said Friday that a corrections officer facing charges related to the escape has been suspended without pay. Gene Palmer's suspension from his $72,644-a-year job comes after he was arrested Wednesday night on charges of promoting prison contraband, tampering with evidence and official misconduct. Palmer has told investigators he provided paint, tools and prison catwalk access to Matt and Sweat. The veteran guard says he had no idea they were planning to escape, and investigators have said they have no reason to believe otherwise. He is free on $25,000 bail. Another prison worker, tailor shop instructor, Joyce Mitchell is charged with helping them escape. Authorities say Mitchell smuggled hacksaw blades, a screwdriver and other tools into the prison by hiding them in frozen meat that Palmer delivered to the inmates.